After each family took pictures with Joe, while wearing his three New England Patriots Super Bowl rings, everyone climbed aboard to experience the legend of Codzilla, firsthand. Kids (and parents) screaming, music blaring and water splashing all made for an exciting, wet ride around the harbor. And, the perfect ending for this fun-filled adventure on Codzilla? Ice cream cones for everyone! 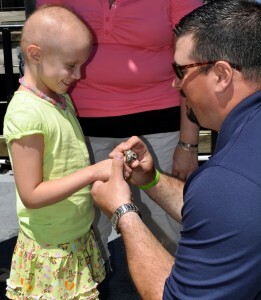 It was the perfect summer day for the kids to get out of the clinic and take a break from treatment for an afternoon. 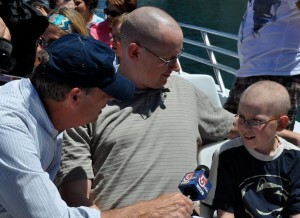 Patients and their families enjoyed the fast turns and salt water as they sped out of Boston Harbor. 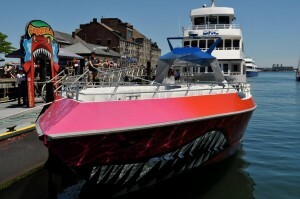 “Getting wet was awesome!” said one patient as we docked the Codzilla. 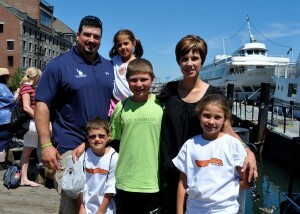 The Joe Andruzzi Foundation wants to help put smiles on the faces of patients and their families. By doing outings like the Codzilla our hope is that it gives the patients and families a time to enjoy each other. We look forward to making the Codzilla Thrill Ride an annual event.